When most people think of Tudor queens, they imagine Anne Boleyn, Catherine of Aragon, and other queen consorts who were unfortunate enough to have married Henry VIII. Hidden among these queens is Catherine of Valois, and if it wasn’t for her, we would not have the Tudor dynasty to enjoy at all. Catherine of Valois began her life in Paris, France, at the beginning of the 15th-century. Her parents were Charles VI and Isabeau of Bavaria. Unfortunately for Catherine, her father suffered considerably from mental illness. From time-to-time, this illness caused him to not recognize his wife. At one stage, he killed several courtiers after causing a fire at a ball. While Catherine’s father was mentally unwell, her mother was forced to protect his throne. Early modern historians writing between the 16th and 19th centuries interpreted her actions as being tantamount to child neglect and brandished her as a bad mother. However, contemporary accounts if Isabeau tell a different story. She regularly gave her children toys, and even sought an education for the girls, which was an unusual move at the time. In 1419, The Treaty of Troyes determined that Catherine of Valois would marry Henry V. At the time, England and France had been embroiled in the Hundred Years War, which saw the English constantly struggle to gain control of land in France. The Treaty saw Henry successfully establish himself as next in line to the French throne, and he gained a bride. 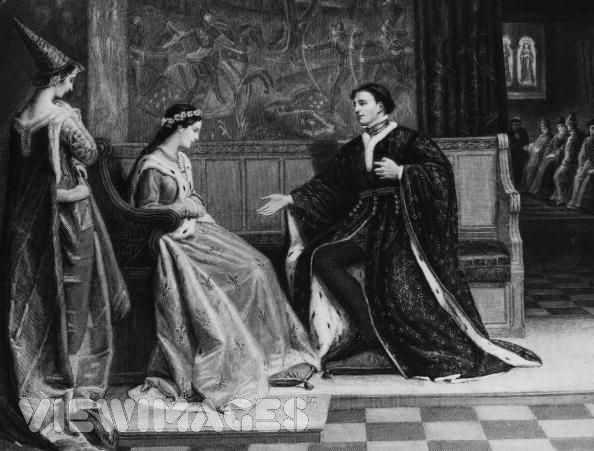 By 1421, Catherine of Valois had given birth to Henry VI. Unfortunately, her husband died of dysentery while on a peace keeping mission in France not long after. This left Catherine alone in England, under the protection of her husband’s family. By the late 1420s, Catherine met Owen Tudor. How she met him has been disputed, but there are some romantic stories floating about. Some claim that she saw him washing by a lake, and made her way down there dressed as a common woman to introduce herself to him. Others claim he fell into her lap while dancing clumsily at a ball. Regardless of how they met, they did, and they were secretly married sometime around the end of the 1420s. In 1430, Edmund Tudor was born. It was thanks to Edmund’s birth that the Tudor dynasty was later established. As Edmund went onto marry Margaret Beaufort, he established the Tudor dynasty when his son Henry VII was born. In 1436, Catherine of Valois retired to Bermondsey Abbey. Some claim this happened because her marriage was discovered. Others believe that this happened because she suffered from a mental break down. In 1437, she died.